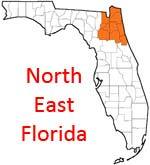 Come to Northeast Florida and discover an area rich in history and natural beauty. St. Augustine and Fernandina Beach have fascinating tales to tell of long-ago Florida. Close-by, some of the state's premier golf and tennis resorts call this place home. And all along the Northeast coast, gorgeous golden beaches await you. Those with a yen for the historical will fall in love with Northeast Florida  and perhaps fall in love again while walking its gorgeous beaches. Rich in history, beautiful, quiet Amelia Island offers visitors oceanfront accommodations in several luxury resorts as well as more moderately priced lodging in hotels and B&Bs in Fernandina Beach. With its towering sand dunes and russet-colored salt marshes, Amelia more closely resembles its northern neighbours than subtropical Florida. Fernandina Beach, the only incorporated city on the island, boasts a picturesque seaport and a 50-block restored historic district that can be toured through the Amelia Island Museum of History. Jacksonville, just to the south, offers a sunny, warm climate year round, perfect for enjoying its 20 miles of soft, white sand beaches and more than 50 golf courses. The St. Johns River, a beautiful but quirky waterway that runs south to north, slices through the city's downtown area, providing plenty of scenery. Visitors will enjoy the Jacksonville Landing, a festive waterfront marketplace with unique shops and restaurants; two Riverwalks; the Jacksonville Zoo; Kingsley Plantation; and a number of good museums. Outdoor activities include hiking, kayaking, biking and watersports. The city of Gainesville also offers a number of natural attractions. At Devil's Millhopper State Geological Site, you can descend 232 steps into a giant sinkhole. At Paynes Prairie State Preserve, see wild horses and a resident herd of bison. Nearby, in Cross Creek, tour the Marjorie Kinnan Rawlings State Historic Site where the author penned her famous work, The Yearling. Upscale Ponte Vedra Beach just north of St. Augustine is often described as Florida's ritziest destination because of its deluxe golf and tennis resorts. The Ponte Vedra Inn & Club offers first-class greens. Nearby, Marriott at Sawgrass is the official hotel of the Tournament Players Club (TPC), home of The Players Championship, and is the Association of Tennis Professionals (ATP) Tour International Headquarters. Visitors escape to the past in St. Augustine, the nation's oldest continuously occupied European city. Tour the historic district by horse-drawn carriage (something visitors have done since 1877) or trolley, or join the energetic who take off on foot armed with any of several good tour maps available locally. Visit the 17th-century Fort Castillo de San Marcos, the reconstructed 18th-century Spanish Quarter, historic churches, and colorful re-enactments of Colonial days complete with authentically costumed actors. St. George Street, a cobbled lane that bisects the historic district, offers quaint shops, some good restaurants and several historic attractions. Golfers won't want to miss the new World Golf Village. Across Matanzas Bay by way of the fabled Bridge of Lions, you can tour the St. Augustine Lighthouse and Museum and visit native reptilians at the St. Augustine Alligator Farm. Accommodations include charming B&Bs in the historic district and oceanfront hotels along the city's 24 miles of lovely beaches. Flagler County to the south of St. Augustine houses some of the quieter communities along the coast. Here, visitors enjoy 20 miles of beaches, historic ruins, public rose gardens and excellent golf. The Grand Haven, a spectacular new Jack Nicklaus-signature designed golf course, has opened on the Intracoastal Waterway at Palm Coast Resort, just north of Flagler Beach, as has the Ocean Hammock, one of the few premier golf courses in the United States with six holes directly on the ocean. Also in Palm Coast, visitors may want to check out the Princess Place Preserve which contains the oldest standing homestead in Flagler County as well as nature trails through several different ecosystems. Inland, the small town of Palatka rests along the banks of the St. Johns River. Though it's known for its bass fishing, there are plenty of other reasons to explore this back road treasure including Victorian-era homes (some of which are now bed and breakfast inns), river cruising and Ravine State Gardens, at its peak in February and March when the azaleas are in full bloom.